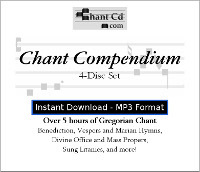 Add Chant Compendium 6: a.k.a. 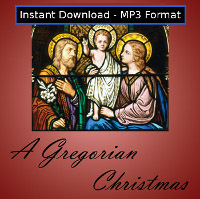 A Gregorian Christmas to your cart! 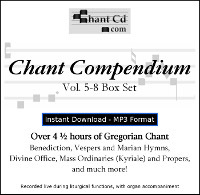 Get this and 3 other Chant Compendium CDs in a box set for only $32.99! Chant Compendium Vol. 5-8 Box Set. 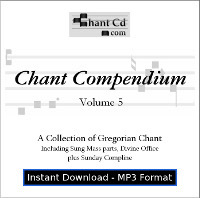 This should have been called Chant Compendium 6! 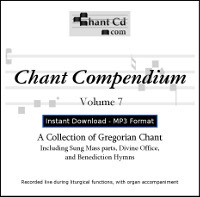 Released as A Gregorian Christmas. You and your family will enjoy this live recording which includes much of the 3rd Mass of Christmas Day, part of the Divine Office for Christmas Eve, and several Marian hymns. These sacred melodies will surely help you capture the rich beauty of Gregorian chant. A wonderful addition to any Catholic home. Contains Kyrie, Gloria, Sanctus, and Agnus Dei from Mass 2 (a more solemn melody used for major feasts), Mass propers, and other content similar to Chant Compendium 1-5. 17 tracks in all; 65 minutes. Includes lyrics sheet. Order your copy today!